In many ways, Jackson Browne was the quintessential sensitive Californian singer/songwriter of the early ’70s. Only Joni Mitchell and James Taylor ranked alongside him in terms of influence, but neither artist tapped into the post-’60s zeitgeist like Browne. While the majority of his classic ’70s work was unflinchingly personal, it nevertheless provided a touchstone for a generation of maturing baby boomers coming to terms with adulthood. Not only did his introspective, literate lyrics strike a nerve, but his laid-back folk-rock set the template for much of the music to come out of California during the ’70s. With his first four albums, Browne built a loyal following that helped him break into the mainstream with 1976′s The Pretender. During the late ’70s and early ’80s, he was at the height of his popularity, as each of his albums charted in the Top Ten. Midway through the ’80s, Browne made a series of political protest records that caused his audience to gradually shrink, but when he returned to introspective songwriting with 1993′s I’m Alive, he made a modest comeback. 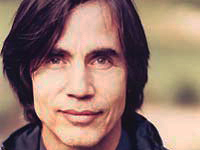 Born in Heidelberg, West Germany, Jackson Browne and his family moved to Los Angeles when he was three years old, and by the time he was a teenager, Browne had developed an interest in folk music. He began playing guitar and writing songs, which he sang at local folk clubs. Early in 1966, he was invited to join the Nitty Gritty Dirt Band, whom he had met through the L.A. folk circuit. While he was only with the band for a few months, the group recorded a handful of his songs on its first two records. By the beginning of 1967, he had signed a publishing deal with Nina Music, a division of Elektra Records; Nina helped Browne secure songs on albums by Tom Rush and Steve Noonan in 1968. During 1967 and 1968, he lived in New York’s Greenwich Village, where he played in Tim Buckley’s backing band. Browne also began working with Nico, who recorded three of his songs on her Chelsea Girl album. When their relationship disintegrated in 1968, he returned to Los Angeles, where he unsuccessfully tried to record a solo album and form a folk group with Ned Doheney and Jack Wilce. Browne continued to play local clubs and his reputation as a songwriter continued to grow, with Linda Ronstadt and the Byrds recording his songs. By the end of 1971, he had signed with David Geffen’s fledgling Asylum Records on the strength of his widely circulated demo tape. Jackson Browne was released in the spring of 1972, spawning the Top Ten hit single “Doctor My Eyes.” Shortly after “Doctor My Eyes” reached its peak position, “Take It Easy,” a song Browne co-wrote with Glenn Frey, became the Eagles’ breakthrough hit. Many songs from his debut, including “Rock Me on the Water” and “Jamaica Say You Will,” became singer/songwriter standards, but the album itself didn’t establish Browne as a pop star, despite its hit single. On his second album, 1973′s For Everyman, he began a long-term collaboration with instrumentalist David Lindley. For Everyman was a commercial disappointment, yet it consolidated his cult following. Released in the fall of 1974, Late for the Sky expanded Browne’s audience significantly, peaking at number 14 on the charts and going gold by the beginning of the following year. Browne’s first wife, Phyllis, committed suicide in the spring of 1976, but in the wake of the tragedy he recorded his commercial breakthrough album, The Pretender. The record climbed into the Top Ten upon its fall 1976 release, going platinum in the spring of 1977. In the summer, Browne launched an extensive tour, recording a new album while he was on the road. The resulting record, Running On Empty (1977), was a bigger success than its predecessor, peaking at number three and launching the hit singles “Running On Empty” and “Stay/The Load-Out.” With his career riding high, Browne began to pursue political and social causes, most notably protesting the use of nuclear energy. The success of Hold Out, the 1980 follow-up to Running On Empty, was evidence of Jackson Browne’s popularity. Though the album wasn’t as well crafted as its predecessors, it became his only number one album upon its summer release. In the summer of 1982, “Somebody’s Baby,” from the soundtrack of Fast Times at Ridgemont High, became Browne’s biggest hit, climbing to number seven on the U.S. charts. Divided between love songs and political protests, Lawyers in Love was another hit due to success of the hit singles “Lawyers in Love,” “Tender Is the Night,” and “For a Rocker.” Nevertheless, the album also showcased a newly found social consciousness, which dominated 1986′s Lives in the Balance. The album lacked any hit singles, yet its fiery condemnation of the Reagan era won an audience — the album stayed on the charts for over six months and went gold.